Wine- sweet, sweet heaven in a bottle. Or so we've heard. The custom of giving wine as gifts has spanned centuries, and is ever more popular today. And why not, it makes a great gift! 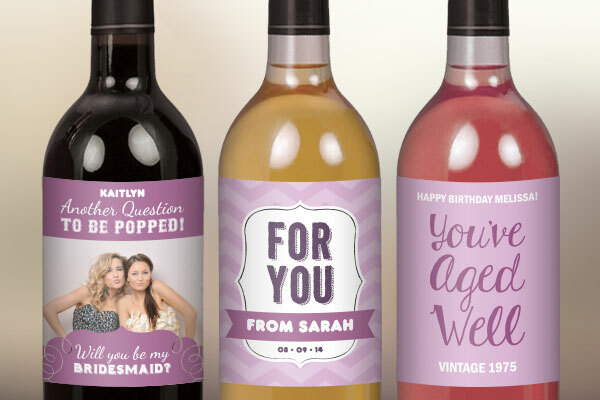 However, you'll want to raise your glasses to this great idea that is both fun and practical: Custom Wine Labels! If you own your own winery, you know all about creating labels to match your flavour and brand. However, for everyone else who buys their bottles from the store we suggest creating your own custom wine labels. Custom labels are great for milestones birthdays, large events, holidays, weddings and more. They can be used by individuals and companies. Some companies create their own custom labels that say "ThankYou" and give them to top clients to show appreciation for their patronage over the past year. Others give them to staff members who have passed a specific length of time with their company or whom are retiring. We've had many customers create custom wine labels for weddings over the past years. You can create wine labels for your bridesmaids or groomsmen to ask them to be in your wedding party. Get super personal and add pictures of you and your best friend and your wedding colours. Custom wine labels can also be created to use as centerpieces at weddings. Have the table number on the front and the menu on the back for both practical and stylish table decor. It's never been more easy or more fun! Click here to start creating your own custom labels. Choose from our gallery of templates and alter to fit your wedding, or upload images or designs to create your own. order and re-order as any as you like. Your wine will look great and will never have tasted so good.